Parks Bureau map of proposed alignment for the Sullivan’s Gulch Trail. Imagine a non-motorized transportation facility similar to the Springwater Corridor Trail that would extend the Eastbank Esplanade via a rail-trail along I-84 all the way east to the I-205 path and the Gateway Regional Center. That’s the vision for the Sullivan’s Gulch Trail and yesterday the project took an important step toward becoming a reality. The City of Portland has issued an official notice looking for people to sit on a new Sullivan’s Gulch Trail Project Advisory Committee (PAC). 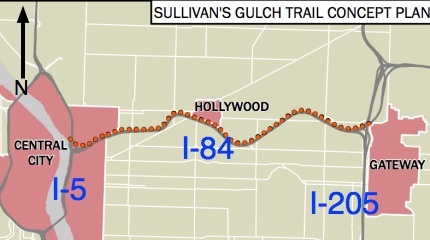 According to a statement from the Parks Bureau, the new PAC will, “assist in the development of a concept plan for the future Sullivan’s Gulch Trail.” The PAC will work with a team of consultants to figure out the trail alignment, basic design features, a cost estimate, and more. The Sullivan’s Gulch Trail has floated around local bike planning circles since it was listed in the 1996 Bicycle Master Plan as a “Priority 3” project to be completed in “10-20” years. Momentum for the trail has simmered since then due its complexity (lots of private landowners along the rail right-of-way) and cost (which the Bike Plan for 2030 lists as just over $27 million for the entire project). In 2008, Portland Parks & Recreation won a $250,000 grant from Metro to conduct a feasibility study. This PAC is part of that study process. Parks spokesperson Beth Sorensen says the PAC will spend the next year with City staff and consultants and the goal is to present a concept plan to City Council in January 2012. There will also be three community meetings where the public can learn more and offer input. If you’re interested in serving on the advisory committee, download the application form on the Parks Bureau website. — For further reading on the Sullivan’s Gulch Trail, download the 2004 study completed by Portland State University planning students. This is VERY welcome and exciting news. It will be so delightful to have a traffic and cross-street free east/west route. Sure, there’ll be the roar of 84 and trains, but I’d gladly trade that for a flat, stressfree route. 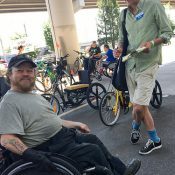 Is it too much to hope for some movement on the North Portland Greenway, too? Very exciting news. The trail could be a real step towards unobstructed, long-distance active transport infrastructure. Planning is a euphemism for stalling. There’s no reason this shouldn’t have already been funded and built by now. Very cool in concept, but if “world class” is $27 million, can’t we do “practical” for maybe $20 million? I suppose the major costs are private property acquisition and laying the bed/asphalt, so maybe the incremental expense of “world class” is not that much. But even calling it “world class” is just asking for voter backlash. I can see the headlines now. Also, playing devil’s advocate for a moment, if the purpose of off-street infrastructure is primarily to appeal to those “interested but cautious” commuters presently too scared to ride most city streets, will those same people be attracted to an isolated, often dark urban trail? It’s very rare I avoid any area on my bike due to perceived risk, but I would say my perceived risk is higher on the Springwater Corridor Trail than on practically any street I can think of in the City. Maybe I am overly comfortable with traffic, and hyper aware of questionable characters two feet away on tight trails, gazing at my bike as I roll past. To say nothing of obstacles created by meandering kids on scooters, flapping dog leashes, and ambulating pedestrians blocking eight feet of a ten-foot wide trail. I guess one of my points in the rambling above is that I would like to see a well-lit, wide, easy to use “bike transportation corridor”, rather than another little bike path used primarily by roadies doing wind sprints and families that drove their SUV to the trailhead. If it is going to be the latter, I’d rather save the $27 million and use it to continue to improve the multitude of adequate bike routes on existing surface streets. Those are good points. There are some good examples from Minneapolis and NYC of trails like the Gulch that are safe and inviting. Perception is a strong motivator for getting on a bike. We need to manage the safety of biking near cars, and the safety of corridors like the Gulch. The real opportunity here is to create a seamless trail network from East Portland, the Airport, Clackamas and downtown Portland. Something most riders will feel comfortable on – and that experienced commuters will find quick and convenient. We also hope to see cyclists and other users own conflicts managed by this design. Similar to other new trails in the US were even the non-motorized forms are kept apart for safety. I can see a bike only lane and a ped lane, or some other form of separation. The standard trail width will no longer work. Good point! Building a trail cut into the side of a steep slope within a few feet of an active rail line sounds pretty simple to me. The City should just send some people out there with shovels and see what they come up with. fortunately, that’s one of the few things engineers are good at. We need to get past all the touchy feely planning BS and build something already. I miss when people used to garden that slope. Anyone know who put a stop to that? was it the city or the railroad? oh, yes! and PLEASE connect it to the I-84 trail to simplify & expand east/west access! Great news! I just hope the planning phase considers planting a whole lot of trees et al along the trail, to absorb/mitigate at least *some* of the carcinogenic fumes we’ll all be huffing from the thousands of idling rush-hour vehicles just feet away. Yuk! As a designer who works with engineers I contend that the engineers do not enjoy stalling. The satisfaction in their work comes from having their designs built. On this blog there has been call for well lit and heavily planted route, that requires design. Cutting into the hillside without geotechnical reports risks landslides and lawsuits. The right-of-way and property ownership issues require methodical action. If this trail is to connect with neighborhoods other than downtown and gateway then these connections need to be planned. If anything is glacially slow it would be the permitting. I think of the whining that resulted from bumps on the Esplanade ramps. It the city and the “touchy feely” planners do not insist on a safe, smooth well connected and well lit trail, with the right landscaping that does not clog storm drains with leaves nor drop limbs on the MAX electrical cables then you same people who complained about process will complain about product. Be glad that the project is being planned. The result will be better than if a bunch of “Joes” with shovels just started digging. Even with geotechnical reports, liability is a major concern, especially for the railroad. I hope more details about how it’s going to connect to points intermediate to NE Veteran’s Memorial Greenway and NE Vera Katz Esplanade. I have that much sorted from the initial announcement, and today’s update doesn’t bring anything new to the table. There’s still a lot in between that I can’t map until more concrete information. Every time I blow $27 million, I take a little time to plan it out. in 1996 they estimated 10-20 years to completion. 14 years have already past and we are barely in the conceptual design phase. anyone want to make book on whether or not there will be a completed path by 2016? How about 2026? my main point is not that I want something built without adequate planning or studies done, but rather that the process here seems glacially slow and needs to be stepped up a bit. 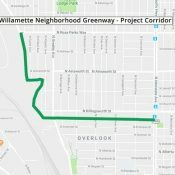 Unfortunately, this project and the North Portland Greenway are limited in terms of how fast they can move by ROW acquisitions, multiple landowner types, liability concerns (especially the proximity of a Class-I railroad to the project area) and multiple agencies with jurisdiction over part or all of the project area. It’s easy to say they’re moving too slow until you look closely at how many parties are involved in the process. A big reason these big trail projects are moving slow is because of a lack of political will to make them happen. Money, logistics, right-of-way, etc… can all be had rather easily if someone wants to make something happen bad enough (look at all the ODOT highway widening projects that happen in the region). The fact is, there is no big political champion for either the NP Greenway or the Sullivan’s Gulch. I find it rather astonishing that no local politician has realized what a great campaign they could make by becoming more vocal and supportive of these projects — especially the Sullivan’s Gulch given it’s job connections and reach into East Portland. The Esplanade happened because of Blumenauer and Vera Katz. Where are the big champions for these trail projects? When’s the last time a bigwig held a press conference or put his/her face in front of them? The Gulch Trail owes a big thank you to Commissioner Saltzman for moving ahead transportation planning dollars that did not exist originally. Also, Sam Adams has been working to creatively get funds transferred to support this planning effort. But a more coherent vision would help all of these efforts move along faster. The idea sounds nice, but I find there are far too many bike-only trails that parallel and are too close to the highway. If the Sullivan Gulch is going to be next to the Banfield, I would not use it due to the car pollution. I cannot stand the path next to I-205 because of this and the I-205 bridge over the Columbia River, which is in the middle of the highway, is an exhaust nightmare, as is the Eastern Esplanade, both of which I try to avoid as much as I can. Environmental studies show that air quality gets far better 100 yards from major traffic lanes, so if the Sullivan Gulch bike path is that far away, then maybe it would be a good idea. For 27 million dollars you should have a path that is healthy to ride on. My preferred route from Gateway to downtown is Tillamook to 53rd, then Everett and Ankeny down to the Burnside Bridge. It gets a little hairy down by the Burnside, but the ride down the residential streets are not so congested with traffic that you are choking every minute of the way. Given that the path’s purpose is transportation, as a bypass to a segment of freeway closed to bicyclists, and not recreation, this really seems like you’re asking too much out of what is, without a doubt, a bicycle highway. 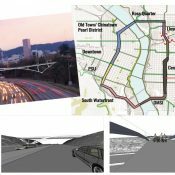 By the time this thing is built, I doubt we’ll be relying on combustion engines anyway..
Obviously it won’t work for you, but unlike the I-205 path, a Sullivan’s Gulch trail would funnel commuters directly into the center city, with a basically level path and no traffic control devices. It would be the preeminent commuter route into town and be more heavily used by bicycles than the Springwater Trail. It’s definitely not ideal for pedestrians, though some would use it, just as they use the I-205 trail. $27 million is a lot of money, but in the greater scheme of things, it’s not really that much, and a bargain given the traffic that would utilize it. And who knows, perhaps some office worker or soccer mom will see all those cyclists passing by while he or she is stuck in traffic and decide that maybe he or she could give cycling a try – maybe during the Bike Commute Challenge, or on their own. Stranger things have happened. I agree about the air pollution angle. As much as I would love to have a dedicated bike freeway, if it’s right next to all that nasty exhaust I won’t use it, nor would I expect or encourage others to do so. Washington, DC has had a similar trail for about 30 years. It connects the way, way out suburbs to downtown DC. For the very close in section it follows I-66. There is really no problem with noise or air pollution. It seems like the majority of the only right of way for this proposed trail belongs to the Union Pacific Railroad. Having a bike trail right beside the mainline of a major railroad seems like a bad idea to me and I don’t see why they would sell us the property anyway. The City cannot compel them to sell. I believe we would be better off spending the money on projects that can actually be built now. 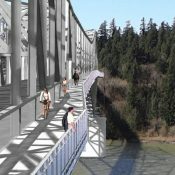 The lower deck of the Steel Bridge is also owned by UP. Somehow transportation wonks, such as Mia Birk, Rob Barnard and the city convinced UP to let it be built. I think most people would agree that this piece of bicycle and pedestrian infrastructure was worth the time, planning and money. it’s about time! 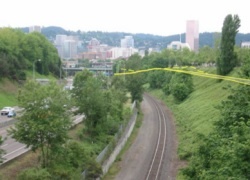 Back in the early 90’s when I lived in the gulch, I would ride my bike (with my dog running at my side) on the utility road next to the RR tracks starting from the 28th St. overpass down to the Steel Bridge and then ride all the way to Willamette park and back. Without ever hitting a street. I felt free and always felt that cars and bikes don’t mix.